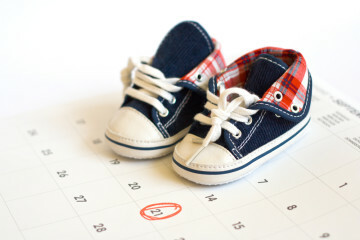 The majority of new mothers in Mississippi report that their pregnancies were unintended, according to the most recently available survey data collected by the Mississippi State Department of Health. The social and economic implications of unplanned pregnancy for women, families and the state are wide-reaching and enduring. Considering the broad array of contraception on the market and the availability of family planning services in publicly funded clinics across the state, Mississippi’s high rate of unintended pregnancy is concerning and deserves study. 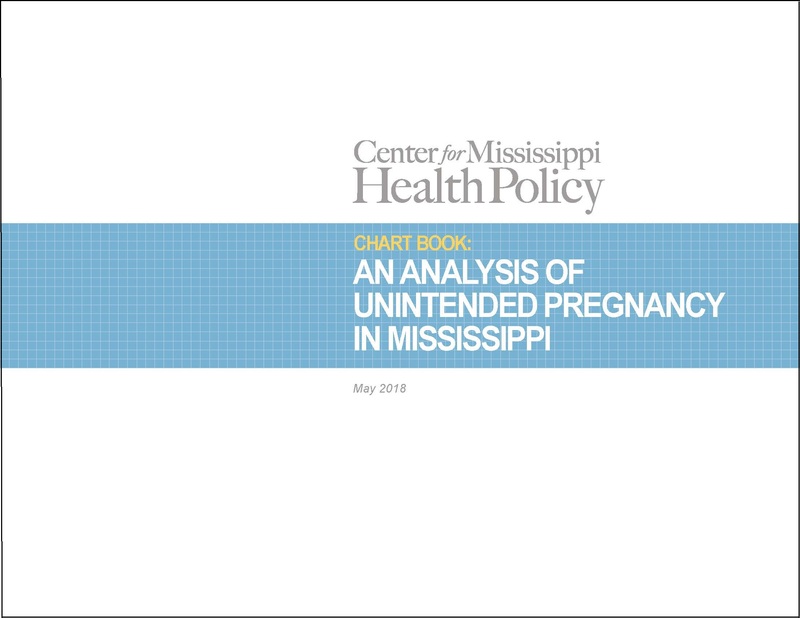 The Center for Mississippi Health Policy has developed an Issue Brief examining data related to unplanned pregnancy in the state. 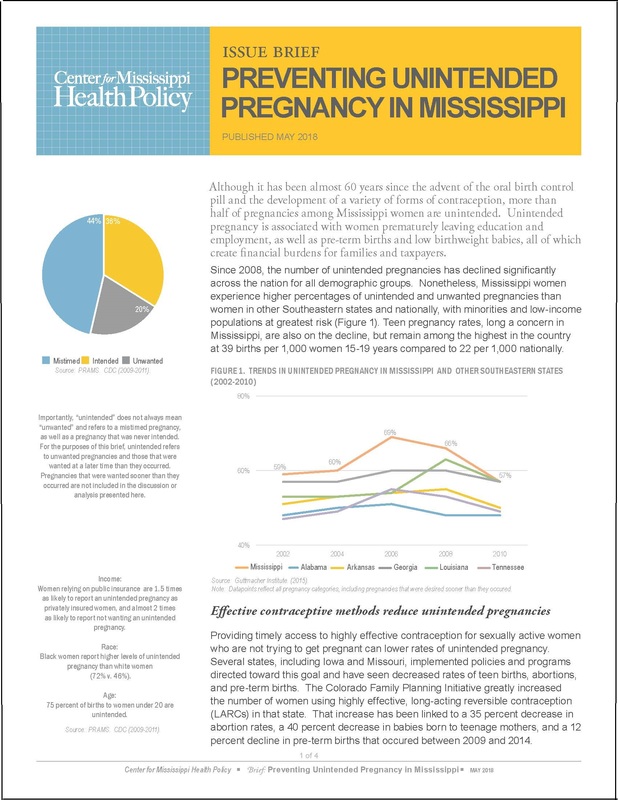 The Center has also produced a Chartbook that examines in more detail the data available about unintended pregnancies and family planning services in Mississippi. The majority of births in Mississippi result from unintended pregnancy. The use of highly effective birth control methods is associated with reductions in unintended pregnancies, as well as teen pregnancies, abortions, and pre-term births. The use of the long acting reversible contraceptives (LARCs) in Mississippi is very low, particularly for low-income populations. Other states have succeeded in reducing rates of unintended pregnancy by providing timely access to more effective birth control methods through health system delivery improvements and provider & patient education. There has been a shift from public coverage to more private coverage of contraceptive services. Despite a shift to more private coverage of contraceptive services, publicly supported family planning services remain critical to assuring access for low-income women. Unintended pregnancy is costly to women, families, and taxpayers. The Medicaid Family Planning Waiver Program, which is funded 90 percent with federal funds, is critical for providing access to reproductive health services for low-income women and has shown success in improving usage of more effective contraception. The Title X Family Planning Program provides access to services for uninsured women, as well as those covered by public and private payors who otherwise may not have reproductive health services available to them. Some states have instituted their own contraceptive coverage mandates to ensure continued 100% coverage of contraception by private insurers in the event federal coverage mandates are eliminated. Copies of the issue brief can be downloaded HERE and the Chartbook HERE. Printed copies of both documents are available by contacting the Center for Mississippi Health Policy at 601-709-2133 or by e-mail at info@mshealthpolicy.com.